ANU’s Prof Philip Piper inspects the cast of a hominin third metatarsal discovered in 2007 as part of the Callao Cave Archaeology Project. Photo: Lannon Harley, ANU. THE Philippines is proving to play a key role in hominin evolutionary history following a discovery by a team of international researchers who uncovered the remains of a new species of human in the region. The new species, “Homo luzonensis”, is named after Luzon Island, where the more than 50,000 year old fossils were found during excavations at Callao Cave. Co-author and a lead member of the team, Prof Philip Piper from ANU says the findings represent a major breakthrough in the understanding of human evolution across Southeast Asia. “The fossil remains included adult finger and toe bones, as well as teeth. We also recovered a child’s femur. There are some really interesting features – for example, the teeth are really small,” Prof Piper said. “The size of the teeth generally, though not always, reflect the overall body-size of a mammal, so we think ‘Homo luzonensis’ was probably relatively small. Exactly how small we don’t know yet. We would need to find some skeletal elements from which we could measure body-size more precisely. “It’s quite incredible. The extremities, that is the hand and feet bones, are remarkably Australopithecine-like. The Australopithecines last walked the earth in Africa about two million years ago and are considered to be the ancestors of the ‘Homo’ group, which includes modern humans. 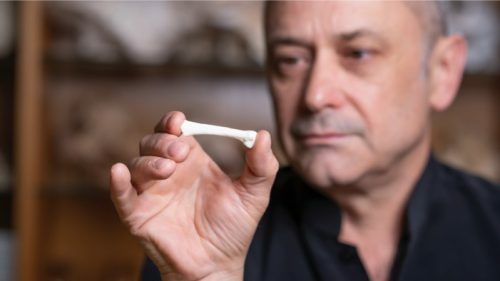 While there are still plenty of questions around the origins of ‘Homo luzonensis’, and their longevity on the island of Luzon, Prof Piper said recent excavations near Callao Cave produced evidence of a butchered rhinoceros and stone tools dating to around 700,000 years ago. “No hominin fossils were recovered, but this does provide a timeframe for a hominin presence on Luzon. Whether it was Homo luzonensis butchering and eating the rhinoceros remains to be seen,” he said. “Homo luzonensis” shares some unique skeletal features with the famous “Homo floresiensis” or “the hobbit”, discovered on the island of Flores to the south east of the Philippine archipelago. The research has been published in the journal “Nature” and is available online.